You are here: Home » GENRE » Science » Ah, grasshopper. 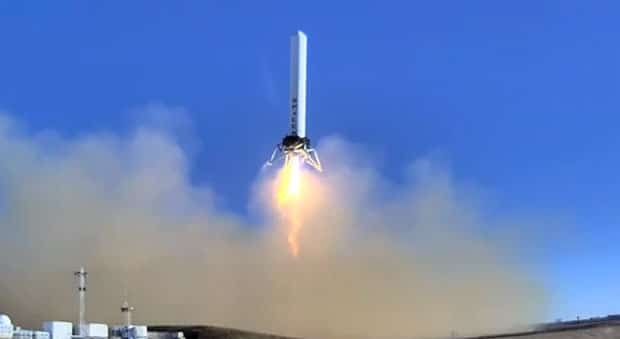 SpaceX’s Grasshopper spaceship shows the world some of that old-style rocket action just like we used to imagine it in Buck Rogers… you know, rockets that could land and take off again without shedding all those stages over the ocean. SpaceX is backed by PayPal founder Elon Musk. When the system is fully developed, Elon will conquer the solar system and sit in his moon base stroking a white cat while issuing impossible demands to the United Nations. « The Mystery Of Existence edited by John Leslie and Robert Lawrence Kuhn (book review).